A “substantial” amount of heroin, much of which was prepackaged in small plastic bags, was recovered from an apartment on Stanhope Street near Cypress Avenue during the Dec. 1 raid. Three people at the premises for the search were taken into custody on drug possession charges. Law enforcement sources said that members of the NYPD Brooklyn North Narcotics Squad conducted the court-authorized raid at 5:35 p.m. last Thursday afternoon. The search was the result of an ongoing investigation into drug activity near the Brooklyn/Queens border. Police did not provide specifics regarding the amount of heroin seized, but noted that it was a large quantity. Various drug packaging paraphernalia and a large sum of cash were also recovered by officers. Two people who reside at the apartment — Eileen Santiago, 38, and Aaron Pereira, 29 — were taken into custody at the scene along with Manhattan resident William Torres, 49. All three were charged with criminal possession of a controlled substance and criminal use of drug paraphernalia. Deputy Inspector Mark Wachter, commander of the 104th Precinct, congratulated the squad for the bust in a Twitter post on Sunday night, Dec. 4. “BIG thanks to Brooklyn North Narcotics for taking these drugs off the streets of#Ridgewood. Keep up the great work! #NYPDprotecting,” Wachter tweeted. 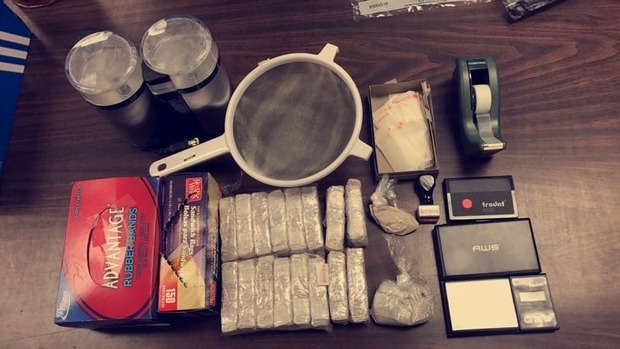 Featured image: Small packages of heroin and drug paraphernalia were found inside a Ridgewood apartment during a police raid last week. Photo via Twitter/@NYPD104Pct. This article originally appeared on QNS.com.